Idag är det Fredag! Och de betyder utökning utav Wii’s VC-bibliotek! Denna veckan bjuds det på en virtuel SEGA MASTER SYSTEM-kassett vilket innehåller spelet ALEX KIDD in Shinobi World! Hur jag än försöker så kommer jag aldrig kunna få det att se ut som om spelet vore nått att ha haha. Spelet går loss på hela 500 Wii Rupees. 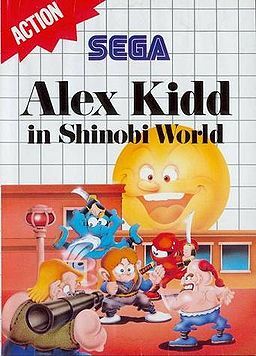 The final title to be released in the Alex Kidd Series, Alex Kidd in Shinobi World is a parody of the Sega game Shinobi. It features Alex Kidd and was released in 1990 for the Sega Master System. As the title suggests, Alex Kidd is essentially thrust into the hero’s role in a Shinobi game. Alex Kidd’s abilities in this game are different from his other games, besides jumping. In the game, Alex Kidd has to rescue his girlfriend, a native of Shinobi World, from an evil ninja named Hanzo. A good ninja fuses into him and gives him his powers. Despite its Japanese look, feel and origin, Sega never released Alex Kidd in Shinobi World in Japan.